Super Bright 5050 LED Light strip for hallways, stairs, trails, and window lighting. 1. 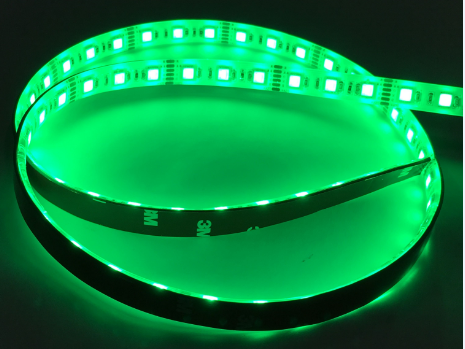 This super bright 5050 Green LED Light strip is ideal for hallways, stairs, trails, windows lighting, especially, it is greatly applied in Backlighting for sinage letters, concealed lighting and advertisement sign lighting. 2. It has 3 chips in one LED, so it is much brighter than most common 2835 LED Light Strip. 3. Because of flexibility, you can put wherever you need the projects to be. 4. It uses 4 ounce copper PCB instead of 2 ounce copper or much worse ones in the market, so it takes much higher current and it maitains long lifespan. Because of this, we provide 5 year warranty for our products. 5. It uses 1.2mm or 0.8mm thick genuine 3M tape on the back, which provides strong adhesiveness. When you install it in a moving vheicle, it never falls off like other filthy thin tapes in the market. 6.It is completely coated, so you can use it in kitchen or anywhere which needs to keep water, dust or oil away. 7. The PCB can be black or white. Most of products in the market are white. If you want it to blend in with the location which you plan to install at, it definetely give you more options. What can we do for you? Email us and let me know what you need!